Welcome your new horse with a collection of grooming tools, horse care products and treats just for him! Introduce him to all your friends or post an announcement by his stall. A cute and practical way to make him feel welcome in his new home. Mane & tail brush with sturdy ergonomic design. The best grooming brush for manes & tails. “Soft Touch” dandy brush to bring out the shine. 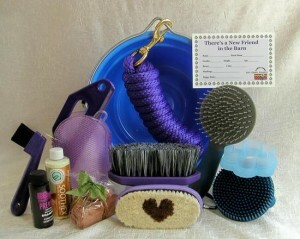 Jelly curry/scrubber to massage your horse clean. Shed Flower by Epona, the bloom that grooms.